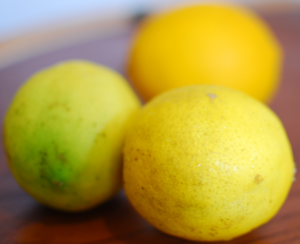 ‘Tis the season for carnival, and…meyer lemons, which means it’s local lemonade season! It’s mid-January, and depending on the day, the weather can sometimes be in the 70s and is ideal for lemonade drinking (although admittedly, I drink lemonade all year long). Have you ever heard of grilled lemonade? I heard about it for the first time last month, and being the lemonade lover that I am, I just had to try it! What’s the difference between grilled and regular? It has a more caramelized, slightly smoky taste to it. If you don’t have a grill, no worries, a cast iron pan on the stove top will work just fine. 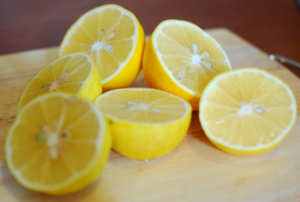 Track down 3-4 meyer lemons (or 5-6 regular lemons). 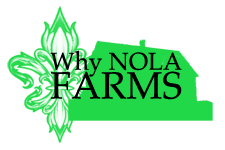 This season, I have purchased meyer lemons from A&K Citrus at the Thursday Crescent City Farmers Market, and also from Hollygrove Farm & Market. Hollygrove was selling lemons from “backyard growers,” so they may be more difficult to track down there. A&K Citrus appears at many of the Crescent City Farmers Markets, and meyer lemons should be around for at least another couple of weeks. Next, cut your lemons in half. Prepare your grill for use, or start heating up your cast iron pan on medium-high. Then, find a large shallow bowl or plate and evenly spread about two tablespoons of sugar across it. 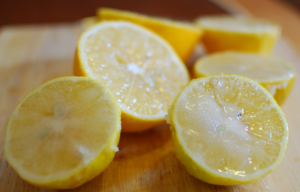 Place each lemon down into the sugar until it is well coated. Check to see if your grill or cast iron pan is ready or hot enough. 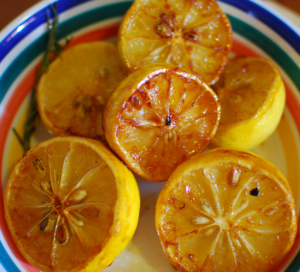 When ready, carefully place the sugared lemons down onto the grill or pan. Allow them to cook until they appear golden and caramelized. 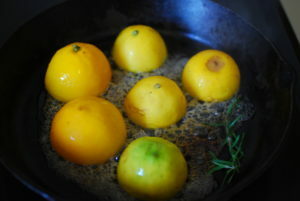 The lemons took about five minutes to caramelize on the cast iron pan. The meyer lemons have reached another kind of beautiful! Allow them to cool down until they are no longer hot to the touch, then juice them while they are still warm. The juice should equate to about one cup. Pour the lemon juice into a container, and add about four to five cups of water, depending on how tart you prefer your lemonade. Add up to 3/4 cup of the rosemary simple syrup. * Use less or add more depending upon your sugar preference. 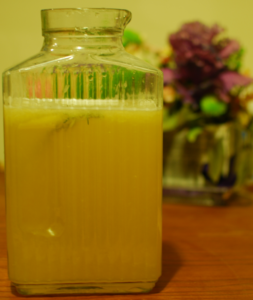 *To make the rosemary simple syrup, bring a 3/4 cup of sugar and 3/4 cup of water with a sprig of rosemary to a boil, then turn off the heat. Allow the sugar to cool, then add it to the lemonade. Enjoy the lemonade over ice or by itself, and share some with a friend or neighbor!